Winco Z-MC-CP64 Cadenza Monte Carlo Coffee Server 64 oz. TigerChef > Tabletop > Beverage Service >< Beverage Servers > Winco Z-MC-CP64 Cadenza Monte Carlo Coffee Server 64 oz. $12.19 Winco BS-64 Stainless Steel Beverage Server with Cover 64 oz. $10.70 Winco VSW-64K Black Insulated Plastic Beverage Server 64 oz. $10.70 Winco VSW-64W White Insulated Plastic Beverage Server 64 oz. 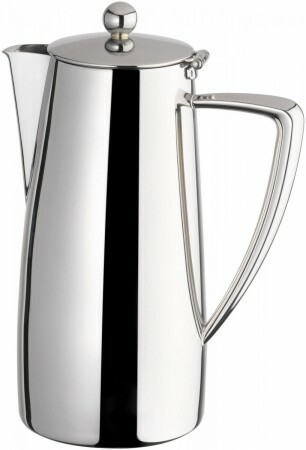 $13.15 Winco VSS-24 Stainless Steel Insulated Coffee/Cream Server 24 oz. $23.94 Winco VSS-508 Stainless Steel Lined Beverage Server 20 oz. $14.29 Winco VSS-33 Stainless Steel Insulated Coffee/Cream Server 33 oz. $8.78 Winco VSW-42K Black Insulated Plastic Beverage Server 42 oz. $8.34 Winco W632 Stainless Steel Beverage Server 32 oz. $31.85 Walco 9-232 Saturn Coffee Server 21 oz. $77.94 Walco P-XC384 Venus Coffee Server 60 oz. $8.78 Winco VSW-42W White Insulated Plastic Beverage Server 42 oz. Provide outstanding coffee service at your restaurant, hotel, or catered event with the Winco Z-MC-CP64 Cadenza Monte Carlo Coffee Server 64 oz. A sleek and sophisticated addition to casual and formal settings, this coffee server is designed with clean, fluid contours that perfectly blend with any decor. Thanks to the brilliantly polished 18/10 stainless steel, this high quality serving piece boasts superior craftsmanship and unbeatable durability for years of use. Combining beauty, value, and performance, this mirror-finished coffee server has a convenient spout for mess-free service and a hinged lid to protect its contents from airborne contaminants. For ease of use, this coffee server has a smooth, comfortable handle. Dimensions: 7 1/2" x 4 3/4" x 9 1/2"